Paid-for quality in a free image editor? That's what you get with Paint.NET, a program that leaves its Microsoft namesake in the dust. Windows comes with its own image editor in Microsoft Paint, but it's fair to say that it's pretty basic. Well, extremely basic – it's more or less limited to cropping, resizing, drawing and... that's about it. That's fine if you're not looking to do much more than the most basic of image edits, but if you want something a little better, you'll have to look elsewhere. And luckily there's no need to shell out a small fortune on an advanced program like Photoshop. Paint.NET provides a more powerful experience than Microsoft Paint could ever hope to match, all for free. It comes with layers, drawing and shape tools, and you use tools like apply blur, sharpen, distort, emboss and more. There are more advanced features, too, like the ability to adjust levels, curves, hue, brightness and saturation. There's a clone stamp tool for cleaning up mess on photos, a red eye remover, a text editor and an unlimited undo log, so you can go back and undo as many changes as you like (compared to a paltry three in Microsoft Paint). 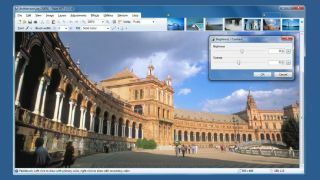 But despite all that, Paint.NET is remarkably simple to use thanks to its intuitive user interface. It's simple enough for novices but contains enough sophisticated tools to satisfy more experienced users. And with enough power to mount paid-for rivals, it's amazing that this program is still totally free.